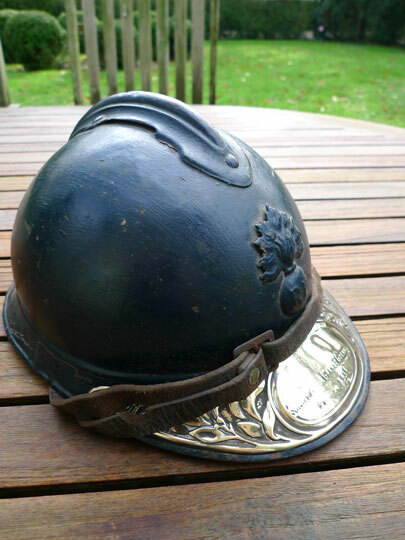 French Infantry WWI Adrian M 1915 helmet Untouched horizon blue 3- piece helmet with age spurs, some surface rust but no dents. First model Infantry Flaming bomb badge with RF (=Republique Francaise). Good fragile brown leather liner and brown leather chin strap. This one comes with an original brass commemorative brass visor plate attached with rivets to the front of the helmet. Soldat de la Grande Guerre and 1914-1918 (= A soldier of the Great War 1914- 1918) in two lines in an oval. These brass visor plates were hand out to veterans after the Great war in 1919 to be affixed to their helmets and showed during parades. These are pretty scarce!